Cloak of Az'atta for auction! "All creatures of Layonara are worthy of my mercy if they choose to accept it. Offer all creatures, regardless of past acts, a chance to accept my mercy, my redemption, and my love. Venture forth into the world and use the gifts that I grant you to aid others wherever possible. Enjoy times of peace and try to uphold it, but do not be passive. Bring peace and redemption to all of Layonara in an active way. Do not, however, take up weapons or dress yourself in armor unless it is to prevent harm from coming to yourself or others." These words are transcribed on every temple, both as a reminder to her people and as a beckoning to others. Az'attans care for those whom request it. Followers of Az'atta's Way are the providers of sanctuary and forgiveness and an outlet for penance and redemption. Seeking peaceful resolution to all that troubles Layonara, Az'attans work hard to uphold her word and to help all who ask it of them. 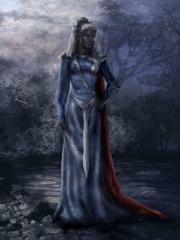 Though she is a dark elf, any appropriately aligned intelligent being can worship her. Az'atta is a goddess of penance, redemption, and love. She accepts any that truly believe in these principles into her service.